Oh boy is this book getting good. For sometime it's been really hard to enjoy Iron Man. The writing by Mr. Faction can be very slow at times but now it's moving into high gear. The US government knows that Tony Stark flew the Iron Man armor while drunk. So they ask him to turn over all the data to them. Tony turns the tables and brings over 19 trucks with all the data they would want on it. As Tony puts it, he gives them the haystack, they need to find their own needle. Meanwhile, The Mandarin sends Whirlwind to an oil field in California and a new powered up Melter to LA. Tony meets with Justine Hammer now working for the US government and they give a silver ring to Tony. The government wants Tony to wear the ring along with his Iron Man armor to monitor him. Also to try to keep him on a short lease. Tony takes the bait and then comes to the conclusion that he has a mole in his company leaking info to The Mandarin. Iron Man shows up in the California oil field and engages in battle with Whirlwind and after a lengthy battle Whirlwind makes a break for it. Just as Iron Man is about to pursue the US government shuts down the Iron Man armor. 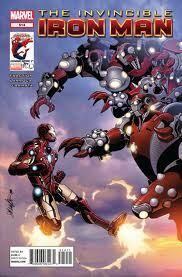 In LA The Melter is destroying the downtown area and War Machine is sent it to deal with him. All in all this was fast paced and the back and forth between Tony Stark and the reps from the government was downright funny. Matt Fraction hit it on the head and Salvador Larroca never seems to miss a beat with the art on this book. Month in and month out he brings his A-game and keeps this book on time. That's rare for a comic book artist these days.